Another milestone has been chalked towards building research capacity for sustainable water and food security in drylands in Africa. 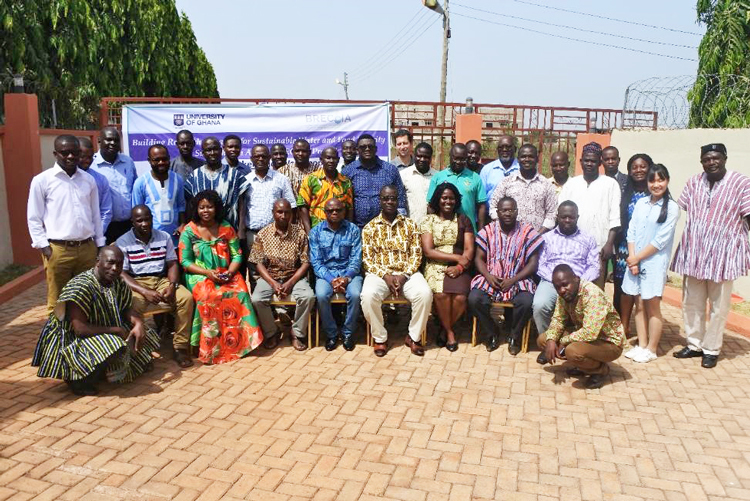 The BRECcIA Project has successfully engaged sub-national level stakeholders from the three regions in Northern Ghana which is considered the driest areas of Ghana. The workshop brought together thirty-one stakeholders representing the media, government agencies, NGOs and academia. In addition to the hosts from the University of Ghana (UG), the BRECcIA team had representatives from the University of Southampton, MMUST (Kenya) and LEAD (Malawi). The BRECcIA team was very instrumental in having participants engage very actively during the workshop. Thus, presentations by BRECcIA members were quite brief while participants were encouraged and guided to discuss issues pertaining to specific sessions. In his welcome remarks, Dr Godfred Jasaw of the University for Development Studies lauded the project as it would enhance research capabilities of institutions towards finding relevant solutions to societal challenges including impacts of the changing climate. Dr Mawuli Dzodzomenyo (UG) introduced the BRECcIA Project and opened up discussions on the co-designing and co-production of research. In the session that followed, led by Moses Asamoah, stakeholders were randomly grouped and asked to identify hotspots for food and water insecurity with the aid of maps and the criteria for selecting those areas. The identified hotspots varied by groups and the common criteria included rainfall, groundwater availability, soil quality and infrastructure. In this same section and in their groups, participants were tasked to identify the challenges associated with availability, access, utilisation and stability for water and food security. The third participatory session on Existing Policy Frameworks related to drylands, food and water security, was led by Yaw Atiglo.In particular, the participants, in their groups, identified specific programmes or policies and how these could help address food and water security issues, the difficulties with implementation and how implementation could be better implemented. The policies that stakeholders discussed included the Farm Input Subsidy Policy, Fertiliser Subsidy Policy, Planting for Foods and Jobs Programme and the National Irrigation Policy. Discussing research gaps led by Matt Kandel, the stakeholders identified some past research projects in the dryland areas and were to note some gaps or challenges associated with those research projects which could be addressed through the BRECcIA project. Among the many challenges identified, poor community participation, lack of a sustainability plan to implement recommendations/interventions, less pragmatic but more academic approaches and poor understanding of the cultural context which led some projects to excessively target women to the detriment of men in the communities were recurrent. In their evaluation of the workshop, most participants indicated their pleasure with the participatory approach employed in the workshop but were least enthused by the load of written exercises and the somewhat inefficient time management.